Judging by my previous reviews, iClever are really clever (no pun intended!) at making great gadgets for use on travels and around the house! The Tri-Folding Bluetooth Keyboard is without a doubt another special gadget to me; being practical, well built and an all-round pleasure to use! This foldable keyboard is perfect for anyone who needs neat, compact and pocket-sized keyboard on the go. It folds up to the size of a large smartphone and easily fits in to your pocket or compartment in a carry bag. The iClever Tri-Folding Bluetooth Keyboard only uses power when it is opened up which saves battery, making it very useful when on the move. Being so portable and travel-focused, it easy to lose a great user experience in a keyboard that has to be designed to be light and portable. The Apple MacBook keyboard faced a similar issue, but I am happy to say that keystrokes on the iClever Tri-Folding Keyboard feel crisp and responsive. Of course, it does not match up with a full-size, non-portable keyboard; but it does a good job of porting those home comforts on the move. Build quality at first touch does feel a little flimsy. 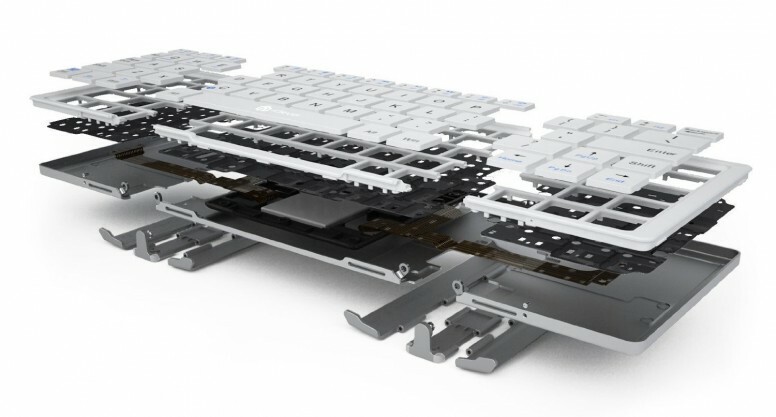 But, this is most likely due to the keyboard being foldable at multiple points on the chassis. Generally, I feel confident with lugging this around in my pocket or bag without the fear of it breaking. The hinges on the folds look as if a lot of effort has been put in to their durable design and are re-enforced to prevent such issues. During testing so far, I have tried and confirmed the iClever Tri-Folding Bluetooth Keyboard to be compatible with PlayStation 3, Sony Bravia TV, iPhone 4S, iPhone 5, iPad, MacBook Pro, Mac Mini and Doro Liberto Android smartphone. Presumably, it will work with any other device which supports Bluetooth connectivity and input – excluding Nokia Windows Phone devices as explicitly mentioned by the manufacturer.